I recently finished reading a book on Malaysian films and literature called ‘Reclaiming Adat’ by Khoo Gaik Cheng. It was the second time I had read the book, for I had finished it some years ago. In fact, a piece of paper slipped out from the book, with the contact number of a friend I made while touring the Joint Security Area between North and South Korea, placing the last reading somewhere near the end of 2009. It was not that long ago, but for some reason, it felt like so much has happened within these past two years. Anyways, I picked it up again in preparation for some research I am about to undertake. One word that kept popping out was homosocial. Watching the new Sherlock Holmes film, that word popped up again. Homosocial. Homosocial. Homosocial. The digital frame of Downey pictures is a nice Christmas gift. 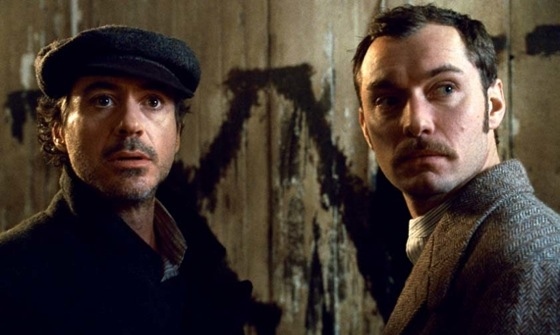 No surprises there, since in this film, we follow the continuing adventures of Sherlock Holmes (Robert Downey Jr.) and Dr. Watson (Jude Law). 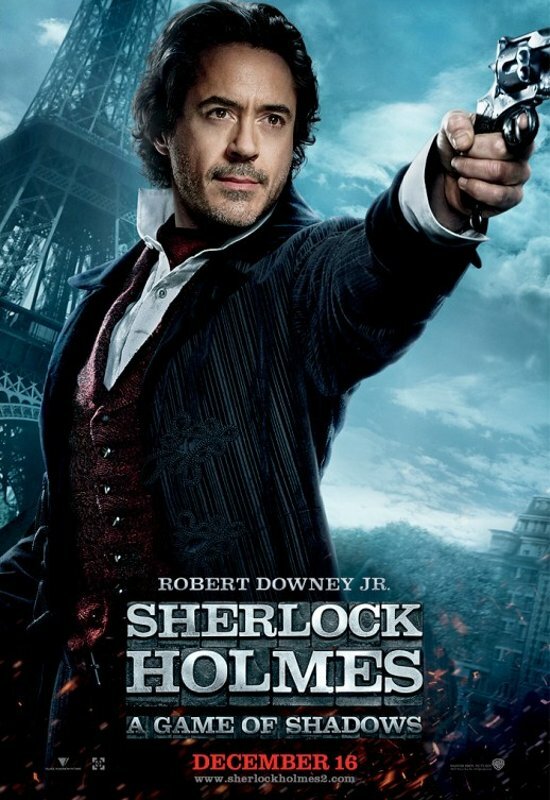 It might say Sherlock Holmes on the poster, but believe you me: without Watson there would be no Holmes. Unfortunately, that is exactly the scenario Holmes is facing in this film. Having gotten engaged by the end of the first film, Watson is now on the verge of getting married to Mary (Kelly Reilly). In fact, the story picks up in the days before he is due to do so, and continues well after he is supposed to be going on his honeymoon. "Did he just call us homo?" Of course, that is a riff on ‘Goldfinger’, rather than an actual line from this film, so don’t go quoting me on that now. Nevertheless, let’s get back to the homosocial before moving on. The relationship in this film, like I said, is one that reflects and complements each other perfectly. I made a case for such differences in the previous post on ‘MI4’. Here, we see an extreme example of how opposities attract and create spaces within which character can grow, for I’d argue that Dr Watson is already married…to Holmes. 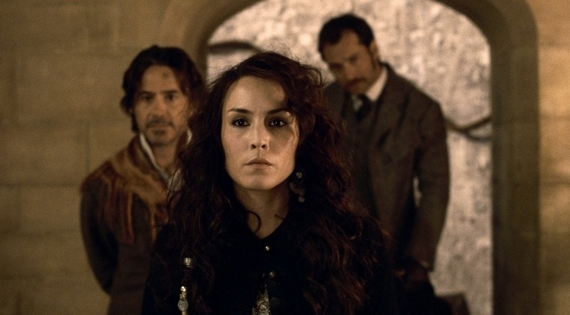 We see how Holmes himself is incredibly disorganised if Watson is not around, and while looking at their relationship within the prism of marriage is not a complete approach, Holmes’s position within their relationship becomes visibly threatened with Mary’s presence. This he did not take to kindly, though the act of throwing Mary off a speeding train into the river in order to save her raised a few eyebrows. “Did you just throw my wife off the train? !” “I timed it perfectly!” Memorable. Of course, like I said, that is a shallow and incomplete approach, but it is one worth considering all the same. In many respects, we see a number of other films displaying such ‘bromance’ traits that I can’t help but place at least parts of this film into that category. 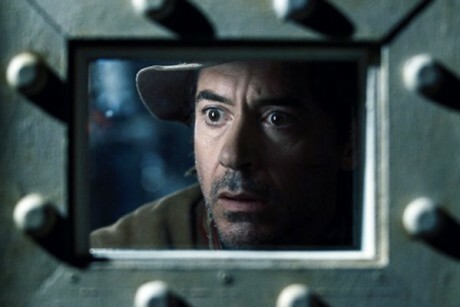 It is not a singular film in its own respects, not by a long shot (in addition to being a sequel, this film is yet another film that can be filed as ‘Robert Downey Jr playing himself and making loads of money doing so’). Moving beyond that, Holmes also crosses several boundaries with his drag outfits at certain points of the film. They’re something to behold, this. Going beyond all this, this film is as much a Guy Ritchie film as it is a Robert Downey Jr one. He remains one of the more visually daring directors working in Hollywood, in the sense that he’s not afraid to mix and match a number of techniques to get the effects. For example, Holmes’s escape through the forest and the efforts of Moriarty’s henchmen to take them down is visually spectacular. It might help to induce some sort of vertigo effects in my mother, but for me, the ‘style for the sake of style’ approach can sometimes be pleasant for the sake of being pleasant. This film, then, hits all the right spots for me. I am especially interested in the strong relationship portrayed between Holmes and Watson, but even a more cursory approach would yield a good time all round for those concerned. It also acts as an interesting precursor and perhaps forewarning to the future, but then again, such events are often seen to be provident with hindsight. 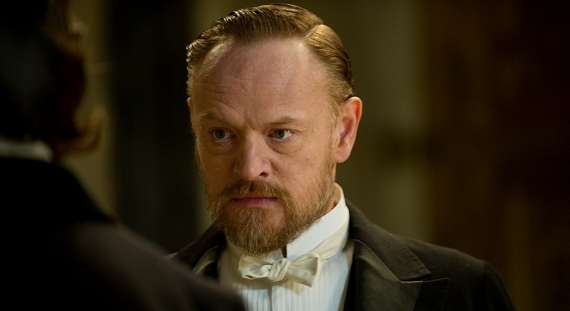 A deeper analysis of these might be interesting to do, and Jared Harris portrays a formidable opponent to Holmes, one who matches Holmes in more ways than one (I am particularly tickled by the final battle between the two of them). It is an action film cleverly told and shown. I enjoy the more intellectual aspects of it, but I think I should give my brain a rest from all the homosocial stuff. To that end I will stop here for now, but at least I wasn’t sitting 5 metres away from the screen now, was I, Vince? Enjoy what could very well be the most expensive bromance film ever made. Fikri‘s mother paid for this one as well.